This Historical Walking Tour is located about half way between San Diego and Los Angeles, located in the hip little beach town of Carlsbad, California. Carlsbad boasts over seven miles of coastline, nine local breweries, and a variety of attractions sure to please travelers and locals of every age. The gem in the crown of Carlsbad is the delightful downtown village that has the charm of an old European city and the atmosphere of a typical Californian coastal resort community. 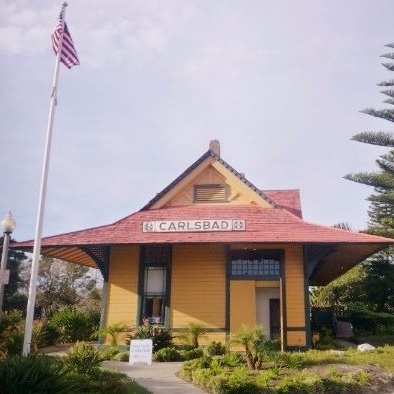 This quaint village, the very heart and soul of Carlsbad, is home to antique shops, restaurants, theater, art galleries, and the original Carlsbad Mineral Water. Historical Walking Tour in Carlsbad, CA has long been a place to gather, relax, and heal. The kick-back beach culture, along with a rich and varied history, makes the city the enchanting spot it is today. Whether you are interested in checking out Carlsbad, or trying our walking tour in nearby Encinitas, CA, we want to hear from you. Contact us today! A ghost story or two! Facts about barber shops that will surprise you! Our journey will last 90 minutes. We will do a lot of walking (about a mile and a half), so wear comfortable shoes!